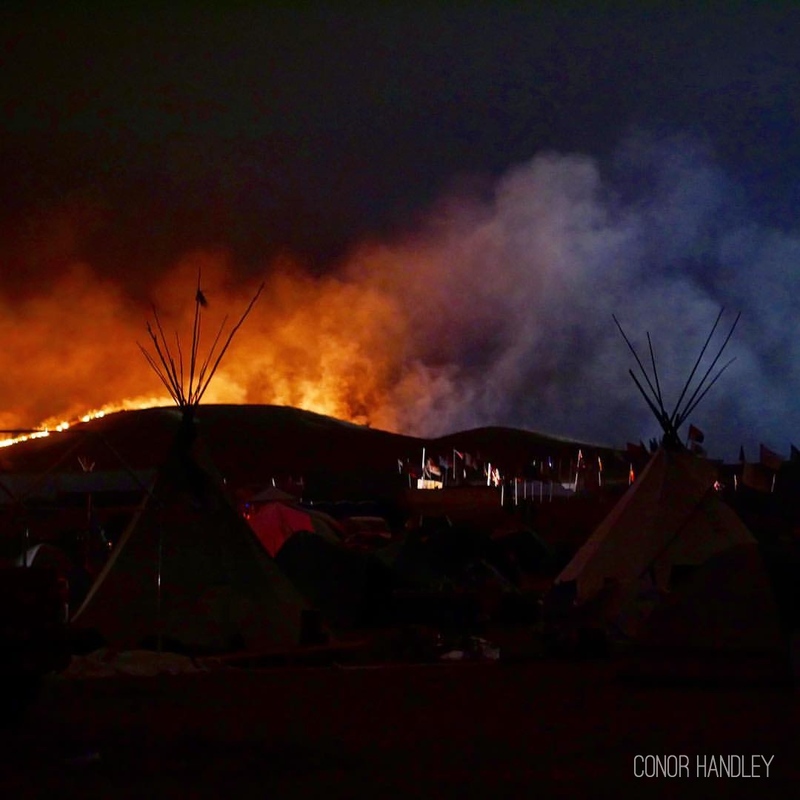 The following are retrieved photos and status updates from Facebook which have captured some of the starkest images of the efforts of water protectors of the Standing Rock Sioux Tribe in their efforts against the construction of the Dakota Access Pipeline and the multiple law enforcement agencies which have come to repress the peoples’ efforts. Fire across from camp. We are all safe, no fire department here and it’s been almost two hours. 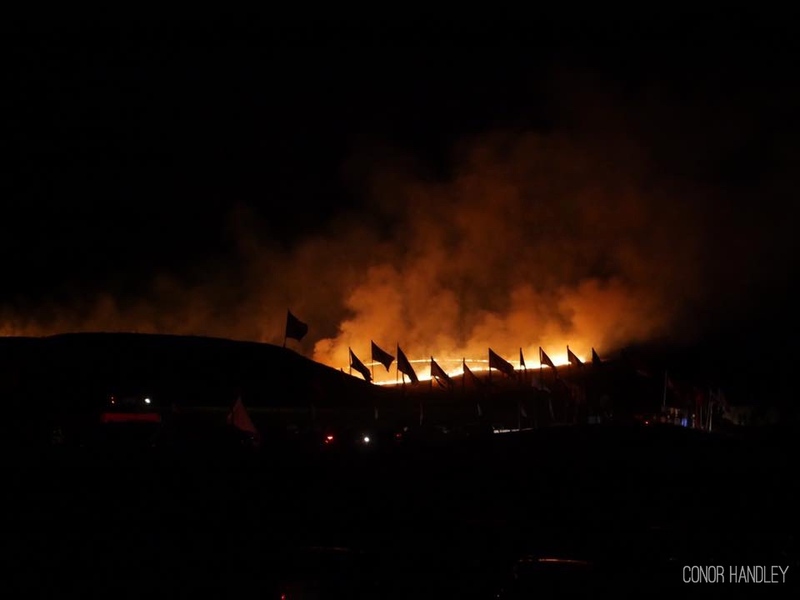 DAPL and police planes stopped flying before the fire broke out. Everyone who can, please come and show this oil company and their puppets, the North Dakota government, that we aren’t afraid. Fire on one side and the lights from DAPL construction and the police blockade on the other. No fire support came for over 7 hours. The fire was within a few hundred feet of camp just across the 1806 highway but the wind kept us safe and blew it in the other direction, towards the construction site. Today many of our protectors tried to cross the river to pray on top of a hill where Oceti Sakowin ancestors are buried, this place has been desecrated by the police and DAPL. The militarized police responded with brutal force, a young man was shot point blank with a rubber bullet and has been coughing up blood, another woman was shot by one of heavily armed officers on a boat. Many of our people tried crossing the river after police destroyed our makeshift bridge, some of them are in critical condition after they were gassed and maced by police and went into shock from the freezing cold waters. Other brave people kept going back by boat to rescue those that were struggling in the cold water but police in their own boat attempted to stop them. These are WAR CRIMES, we are unarmed we are peaceful, no one even lifted a finger against these cops today. I am disgusted by the state of North Dakota and by this country that continues to perpetuate its genocide against Indigenous Peoples. Damn, today was hard. People got hurt, thank creator everyone made it out with their lives. 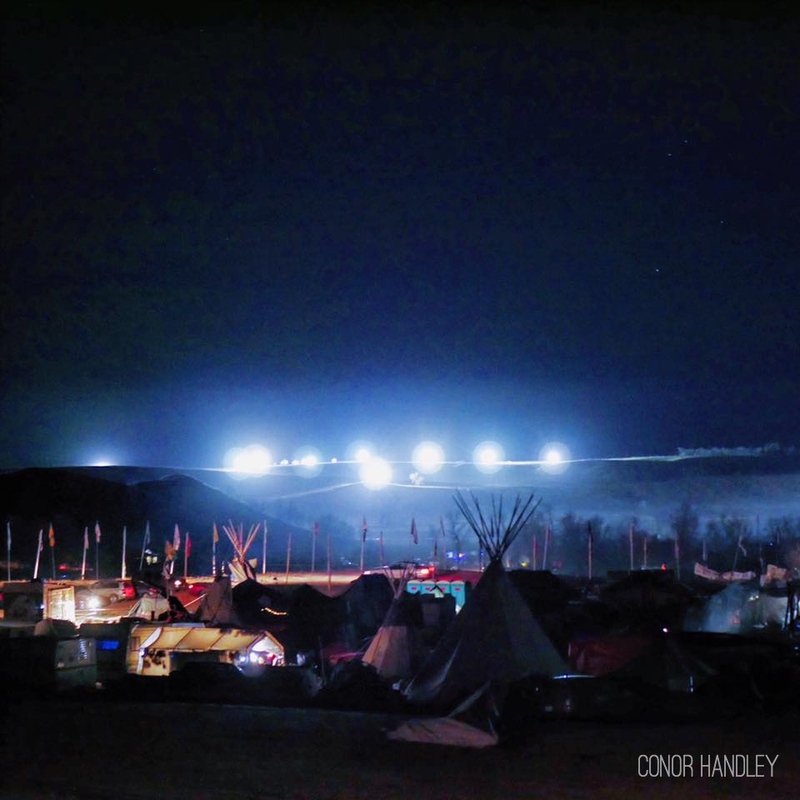 The police, national guard, DAPL (can’t really tell the difference anymore) have set up massive spotlights into our camp that shine all night long, they fly planes and helicopters over us 24hrs a day, even jets with no lights when they feel like it. They are trying to deprive us of sleep, make us lose ourselves and turn on one another. We are living in a war zone. Now I know what my ancestors felt when they were confined to military camps and reservations. But just like our ancestors, still we preserver. Right now I hear roundance songs in the distance, laughter from a hundred different camps as we take care of our wounded and eat dinner. I love this place and the people who have come here to fight for our children’s future. We won’t stand down… And sorry, Obama, another route isn’t going to cut it, we are in this until this black snake and all the rest are dead. These photographs were published on Love and Rage with the expressed permission of Conor. If you wish to re-published them, please contact us.